Posted on Tue, Apr 10, 2012 : 8:12 a.m.
A three-car crash was tying up traffic on M-14 east of Ann Arbor Tuesday morning. The crash occurred on westbound M-14 just west of Ford Road, in the same area where a two-car crash snarled traffic Monday morning. The three vehicles were on the shoulder and not blocking traffic, a dispatcher with the Washtenaw County sheriff’s department said. 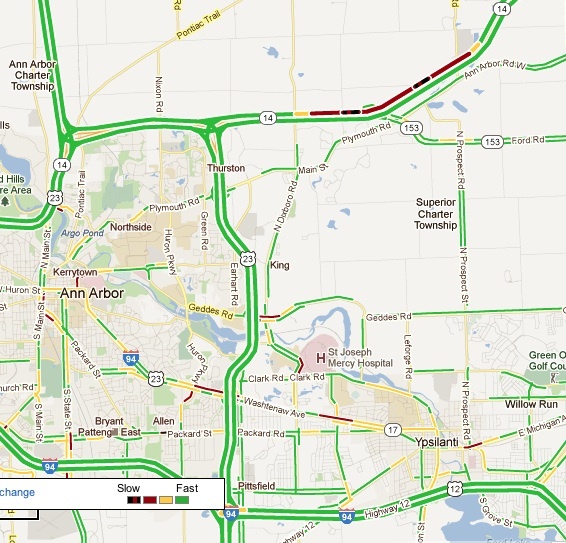 A Google traffic map showed a significant traffic backup in the area. State police were on the scene at 8:10 a.m., the dispatcher said. No further information was immediately available. Tue, Apr 10, 2012 : 5:13 p.m. The editors must not have liked my comment about texting and driving! Perhaps it hit too close to home! I do not know how the accident this morning happened except to say this. IF somebody ran into the back of somebody, then somebody was not paying attention or driving too fast. Period end of discussion! If somebody was texting I stand by my previous statement. They are no different from a drinking driver. Tue, Apr 10, 2012 : 4:30 p.m.
Cut-n-pasted from same story yesterday morning (although I realize this is likely NOT the proximate cause of all these accidents): Ever since MDOT changed the M-14 westbound at US-23 interchange (back a few years ago, when WB on M-14 looking to proceed SB on US-23, two lanes could exit SB onto US-23) they unintentionally created a bottleneck. This due to now only the LEFT lane of M-14 can exit to SB US-23. So what do the goofy &quot;operators&quot; do? Jump into and hold the left lane of WB M-14 for miles, awaiting their exit to SB US-23. They plug the entire WB M-14 freeway up from the Ford Road interchange just to be certain they can exit! Incredibly. Incompetent. Operators. For they certainly are NOT drivers. Contributory factors to many WB M-14 accidents in this stretch. Tue, Apr 10, 2012 : 7:19 p.m.
Then when they successfully do get on US-23 south it becomes like a drag race to see who can get over into the right lane to exit at Plymouth Rd. without getting hit by the eastbound traffic that also exited to go down US-23. Real maneuvering happens in that area..
Tue, Apr 10, 2012 : 3 p.m.
MattA I completly agree with you. I was rear ended on 94 last year by someone that wasn't paying attention to the traffic slowing down due to foggy road conditions. I fortuantly was paying attention and gave my self room to stop. If I hadn't I would have hit an overpass head on. Not to fun when your the cautious one and still become a victim of someone else's stupidity. Tue, Apr 10, 2012 : 2:59 p.m.
M-14 is one of the worst racecourses around. Daily accidents during morning rush hour. Do we need bumper stickers that say &quot;Pray for me, I drive on M-14!&quot;. Leave earlier, slow down and watch the road. Tue, Apr 10, 2012 : 2:28 p.m.
Tue, Apr 10, 2012 : 3:36 p.m.
Tue, Apr 10, 2012 : 2:20 p.m. Isn't his like 3 days in a row......Wake up people its contrustion. We go through this each year. Michigan's Substitute State Tree for the summer is the Orange Construction barrell, don't ya know. Tue, Apr 10, 2012 : 1:51 p.m.
Tue, Apr 10, 2012 : 1:35 p.m.
Tue, Apr 10, 2012 : 3:52 p.m. I love the ones who speed past everyone else that's already moved into &quot;one lane ahead&quot; lane. Or the ones that speed past the shoulder to get to the exit. What's really great, is when that person speed past everyone fails to see the deputy/officer/trooper up ahead also waiting in line. +1 for the good guys. Tue, Apr 10, 2012 : 2:05 p.m.